I just set up a twitter account: ladyfingersblog. I will be posting blogging news and adding tidbits about my daily life. If you are on twitter, please stop by and visit. There will be lots of glitter and fancy tea cups. My sister's cockatiel, Yellow, gives a come hither stare. If you have any recommendations for me about your favorite places to visit on Twitter, do share! 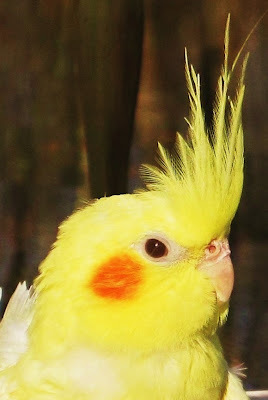 What a cute cockatiel! I used to have a lot of them as pets. Who would have guessed that birds had personalities? And very sweet pets.